I suspect there's a race condition with the RTL-SDR drivers, maybe it's the setup of the PLL is the part that is going wrong. It's not a problem when letting it run without stopping for weeks at a time, only when stopping and starting frequently. So I left it running all the time. To estimate how strong the received signal is compared to the noise, I took the ratio of unexpected data to expected data in dB. This is roughly a month's worth of data. I wanted to try running this on a Raspberry Pi 3 B+ (1.4GHz). 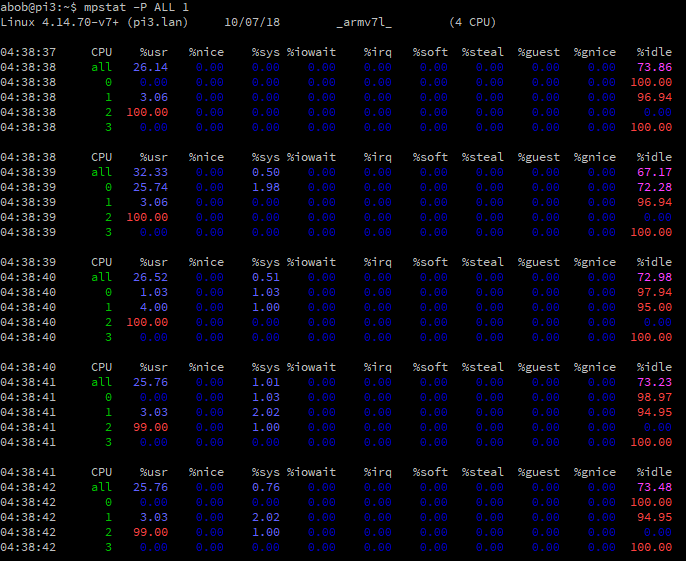 In theory, it should be significantly less power usage than the x86 server I have it running on now. The x86 server I have uses around 50 watts when it is idle. The Raspberry Pi 3 B+ uses under 2 watts when idle. I put the latest raspbian on it, installed the gnuradio (version 3.7.10.1-2) and gr-osmosdr (version 0.1.4-12) packages, and tried running my decoder. 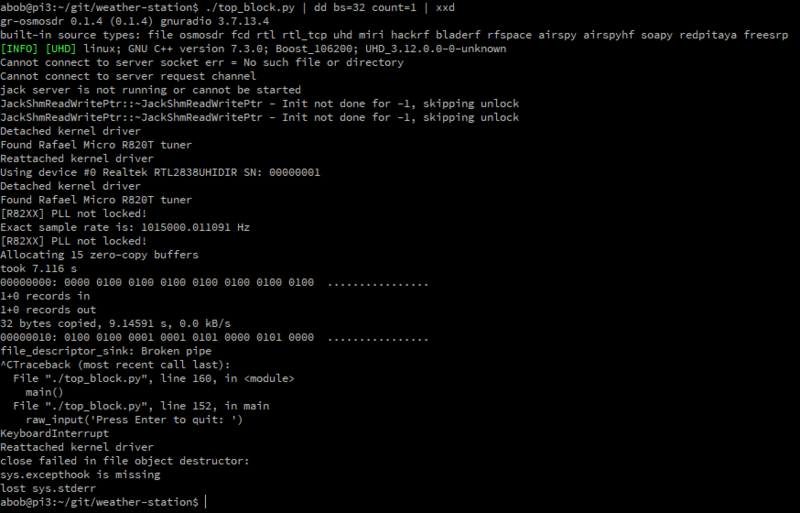 So I setup a network block device (nbd) so the Raspberry Pi could use the disks of a proper server. It's much faster: Read 93.75Mb Written 62.5Mb Total transferred 156.25Mb (31.96Mb/sec). It's nice to see the new gigabit adapter resulting in faster IO. So I installed the testing version of Raspbian and ran it under a schroot. Testing has newer package versions. Gnuradio version 3.7.13.4-1 and gr-osmosdr version 0.1.4-14+b5. It works! 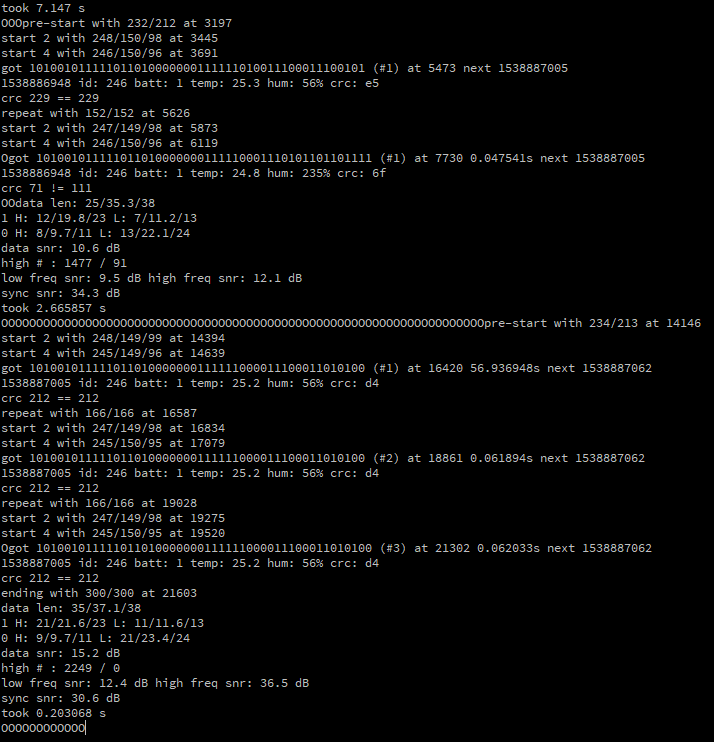 It took a lot longer to start up compared to my x86 machine though, 1.8 seconds vs 7.1 seconds. All those extra letter O's are a problem. They are from gnuradio, signaling that it's losing data (Overrun). It can still receive enough data to work, so it's not a total loss. But it is a sign that things aren't working as well as they could be. From this, you can see core 2 is just at 100% usage. It's not keeping up. It's also a sign of the code not distributing the load over multiple cores, so it must not be threaded. The average cpu frequency (avgf) is at 1.4GHz, so that looks fine. However, I believe it's possible to do this work on as Raspberry Pi. 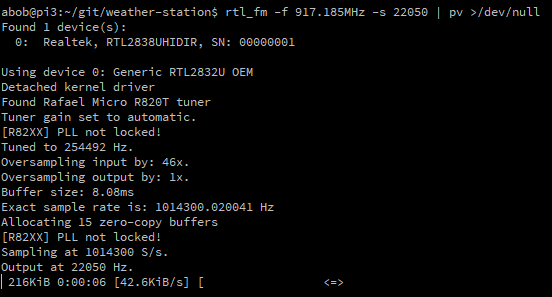 As a comparison of CPU usage, I ran rtl_fm -f 917.185MHz -s 22050 (receive 917.185MHz at 22050 samples per second). So I still have some work to do if I want to run this on a Pi3 B+.